Legend of the Seas which is now known as TUI Discovery 2 is taking shape during its major dry dock. The British-based cruise line released a recent photo of the ship with its new livery where new features and enhancements are being added to cater for the UK market. With less than two weeks until the ship completes its refurbishment workers are onboard the vessel getting it ready for its first cruise for Thomson Cruises on May 14, 2017. The vessel will be based out of Malaga, Spain for the summer season before moving to the Canary Islands in September 2017 and then cruises out of Jamaica in the Caribbean from the end of November, 2017. The ship’s first sailing for Thomson will be 7-nights with calls in Spain, Italy, and France. 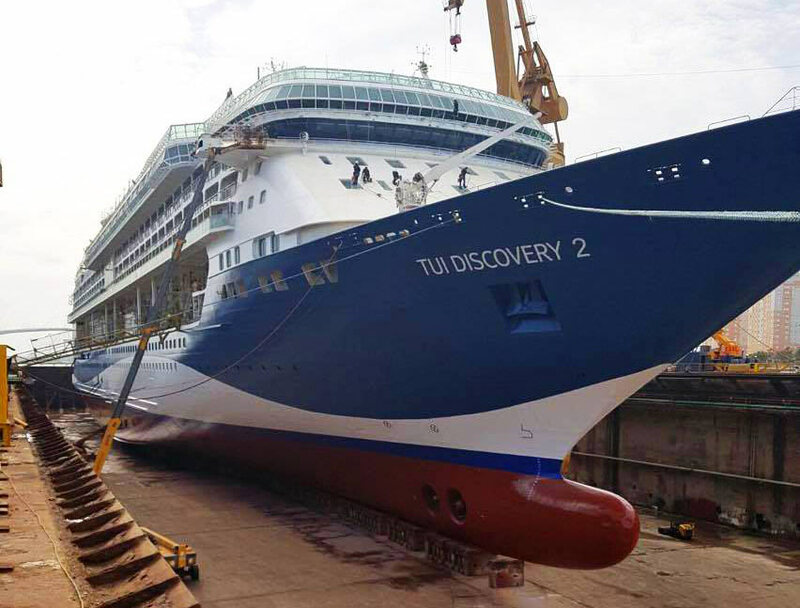 TUI Discovery 2 will be identical to Discover 1 which joined the fleet in 2016. The ship will carry 1,832 guests at double occupancy across 915 cabins and onboard will be the popular rock climbing wall just like the previous Legend of the Seas. The ship will have All-inclusive drinks alongside a selection of premium drinks, all included in the price of their holiday. We last reported that Legend of the Seas was to leave the Royal Caribbean fleet in June 2016.